At Back Pain Center, we provide a variety of treatments to help you become pain free as quickly as possible. We offer the most effective, affordable, and up to date services to provide you with pain relief fast. Back Pain Center provides a variety of treatments and tailors them to your particular health issues. 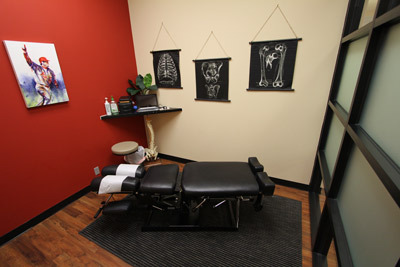 Back Pain Center is fully certified in kinesiotaping for pain management and rehabilitation. Kinesiotaping is a highly effective method of treatment for musculoskeletal injuries, stabilization and it used heavily in running and triathlete communities. For more information please visit Kinesiotaping. Dr. Nicholson and Dr. Grogan are both CrossFit advocates and competitors. They understand the physical demands of the sport, and also the associated injuries. Additionally, Dr. Nicholson is a USA Weightlifting Sports Performance Coach, who is an advocate of proper lifting technique. Back Pain Center offers specialized CrossFit injury diagnosis and treatment, as well as mobility education, to ensure the resolution and prevention of future injuries. Prevention of athletic and weightlifting injuries is a key part of injury management and overall performance. If a patient is unable to properly perform a lift, this could be due to muscular imbalance or improper movement patterns. Back Pain Center is very well versed in many athletic movements. As part of injury management, overall form is examined in order to determine the cause. Our goal is to get you running pain free as fast as possible. We are highly specialized in running injuries and gait analysis. In order to properly diagnose what is causing running pain, we watch you run and break down every aspect of your gait cycle. This is much different than simply having a foot scan, and helps get to the cause of the pain and not just simply treating the location of the pain. If the running pain is of a biomechanical nature, we implement Active Release Technique, Kinesiotaping, rehab exercises and spinal manipulation as methods of highly effective treatment and monitor your progress as you run. Every year, there are over 3 million new whiplash cases in the U.S. which are attributed to automobile accidents. Neck pain, back pain and headaches are common symptoms that patients experience after car accidents. If left untreated, these auto injuries can evolve into more serious and chronic conditions that many people may suffer with for years to come. At Back Pain Center, we understand the mechanism of how these injuries occur, and how to most effectively treat these cases in order to assure that your neck and back pain is managed as quickly and effectively as possible. The Selective Functional Movement Assessment (SFMA) is a series of 7 full-body movement tests designed to assess fundamental patterns of movement such as bending and squatting in those with known musculoskeletal pain. By performing this, clinician has the opportunity to identify meaningful impairments that may be seemingly unrelated to the main musculoskeletal complaint, but contribute to the associated disability. Contact our office today to get started! We’re here for you!